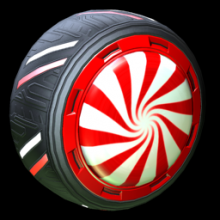 Peppermint are a Very Rare Wheels. Wheels are steering and carrying your Battle-Car. They can either be animated or static. Every wheel has a custom trim or even a custom tire tread. You can equip them inside the customization window in the wheels tab. To get the Peppermint Wheels you can either open a specific crate with a key or trade with other players. You can search for trade offers with Peppermint here.